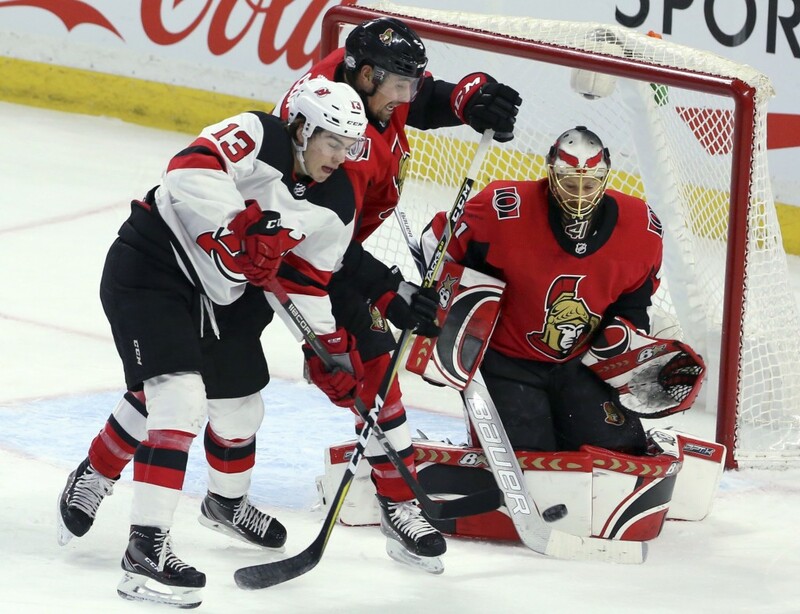 OTTAWA — Matt Duchene had a goal and two assists for the Ottawa Senators in a 5-3 win against the New Jersey Devils at Canadian Tire Centre on Tuesday. “When the pucks start going in, the confidence starts coming,” said Duchene, who has 14 points (six goals, eight assists) in his past 14 games. “I felt like when I first got here there was about 10 or 15 games, and out of those games there were probably 12 of them where we just couldn’t get started. Mike Hoffman had a goal and an assist, and Craig Anderson made 30 saves for the Senators (18-25-9), who have won three of four games. Keith Kinkaid allowed four goals on 20 shots and was pulled in the second period. Eddie Lack made 11 saves in his debut for the Devils (27-17-8), who had won three in a row. Thomas Chabot passed to Colin White in the slot on a rush and he scored his first NHL goal to give the Senators a 4-1 lead at 8:43 of the second period. Devils forward Taylor Hall, playing his 500th NHL game, scored on a power play at 10:54 to make it 4-2. After stepping out of the penalty box, Zack Smith accepted a pass from Jean-Gabriel Pageau and scored on a breakaway at 19:12 to make it 5-2. Kyle Palmieri made it 5-3 with a wrist shot at 5:12 of the third period. Travis Zajac gave New Jersey a 1-0 lead with a snap shot at 1:57 of the first period. Hoffman one-timed a pass from Duchene on the power play at 13:35 first to tie it 1-1, and Christopher DiDomenico gave the Senators a 2-1 lead at 14:33 when his shot deflected off Devils defenseman Sami Vatanen. Duchene’s backhand gave the Senators a 3-1 lead at 18:58. White’s goal at 8:43 of the second period. Anderson’s save against Travis Zajac at 8:07 of the third period. Duchene’s goal at 18:58 of the first period. Hall has 16 points (seven goals, nine assists) in an 11-game point streak. … Alexandre Burrows got his second point in 30 games with an assist on Smith’s goal. Burrows has five assists in 51 games.